MONTGOMERY, Alabama – A new era of collaboration between Alabama business leaders and education officials anchors a series of innovative initiatives that take aim at transforming workforce development efforts and improving educational outcomes in the state. These proposals are detailed in a report prepared by the Alabama Workforce Council, which is now being made available to the public. The AWC, a blue-ribbon panel of business executives, educators and lawmakers, recently presented its 64-page report to Governor Robert Bentley. Alabama Power executive Zeke Smith, chairman of the Alabama Workforce Council, talks about the group's report. Establishing a Statewide Longitudinal Data System to provide better information about education and workforce trends to businesses currently operating or considering expansion in the state, businesses considering moving to the state, economic developers, and state and local education leaders. Creating a statewide awareness campaign to change generational misperceptions about careers in the skilled trades and raise awareness about long-term career opportunities in Alabama. Developing a “One Stop Shop” online resource for Alabama workforce development information. Funding 44 additional PK-12 Career Coaches to serve as educational ambassadors for careers in skilled trades. Developing and implement a statewide Career Fair and Trade Show strategy. Supporting legislation that promotes public/private partnerships. Developing a public/private partnerships Best Practices Resource Guide. Reviewing the current workforce development functions and, by executive, legislative or otherwise necessary action, establish a more streamlined, centralized and accountable organizational structure for coordination and management. Codifying and funding the Regional Workforce Development Councils. Reviewing the structure and alignment of Workforce Investment Boards. To get the word out about its initiatives, the AWC is also launching a web site that outlines the challenges facing Alabama workforce development efforts and highlights the potential solutions being examined to address those challenges. Governor Bentley has long advocated a tighter connection between Alabama’s educational systems and the state’s business sector as an effective way to create a broader pool of skilled workers who are prepared for more technologically advanced workplaces. Greg Canfield, secretary of the Alabama Department of Commerce, believes the AWC initiative represents an important development as state officials devise long-term strategies to deal with workforce trends such as retiring baby boomers and employer demands’ for higher skills levels. “It’s another signpost of our commitment in Alabama to partner with the private sector and address the future workforce needs,” Canfield told Site Selection magazine for a story on the AWC. “The skill set in demand today will change over time and maybe for the first time ever we’re beginning to think more about what we need in the future, five and 10 years from now. The AWC began its work in July, with Alabama Power Co. Executive Vice President Zeke Smith in charge as the group’s chairman. The council quickly got rolling. It appointed duty-specific committees, studied workforce reports from the education sector, assessed current workforce efforts, and determined best practices. Members also consulted with industry experts and evaluated workforce development programs in other states. In a letter to the governor, Smith said the council’s sole mission is to “improve educational outcomes and to promote workforce and economic development” in Alabama. “The needs of industry are changing. There are some tried and true skills that have remained the same, but with the advances of technology we have to make sure that we take where we are today – which is very good – and move it even higher,” Smith added. Read the report to see all of the council’s recommendations, along with other AWC documents that are being made available on the group’s new website. 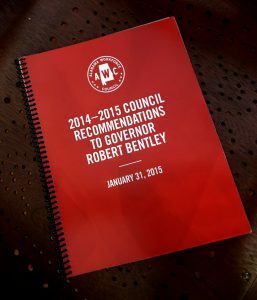 Governor Bentley has said he is studying the recommendations, with a mind to putting them into action. “The recommendations from this council will ensure that as we continue to recruit skilled jobs, we have a workforce that is ready for the jobs,” he said.